If you’re in the market for a boat lift for your property in Islamorada, Florida, but you aren’t sure where to begin, turn to the trusted experts at DECO Boat Lifts. Since 1959, we have been engineering top-of-the-line lift systems that are designed to meet the unique needs of our customers. At DECO Boat Lifts, we don’t offer one-size-fits-all solutions. Rather, we offer boat lift systems with three distinct drives to work with our customers’ boats and budgets. For example, if you’d like a high-performance lift at an exceptionally affordable price, our Maxi Lift is the perfect option. This entry-level system has a heavy-duty aluminum flat plate drive system with lift capacities of up to 16,000 lbs. We also offer our flagship DECO Lift, which features incredibly powerful and quiet lift operation with best-in-class reliability thanks to its proprietary sealed gearbox design. And, if you’d like the industry’s most advanced lift technology, look no further than our Concept CRS Lift that has a direct drive system to achieve unrivaled lift operation with minimal maintenance required. This exceptional lift system also comes standard with our patented Cable Retention System (CRS), which keeps cables firmly in place to significantly reduce wear over the long term. Additionally, we understand that certain waterfront properties have unique docking challenges. For example, in Islamorada, it can be difficult to install the pilings used for standard lift systems. To address this, we offer a variety of lift configurations, including elevator boat lifts that can be mounted directly to the seawall. 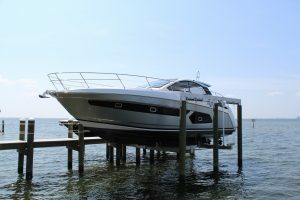 Learn more about the advantages of having one of our boat lift systems installed on your property in Islamorada, FL. Contact us today.